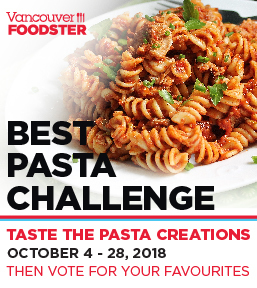 Welcome to the Vancouver Foodster Pasta Challenge. 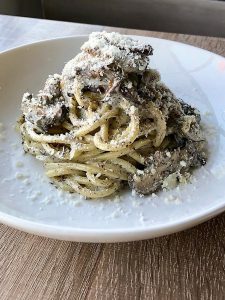 Restaurants from all over the city were invited to enter their pasta dishes into this challenge, some of the restaurants have created a special pasta creation just for this challenge and others have entered their top choice off their existing menu. Each restaurant will be featuring their pasta creation on their menu from October 4-28, 2018. How Does this all Work? 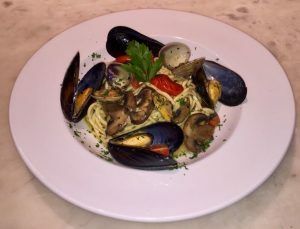 For the public challenge, you are invited to go out and order any or all of the pasta creations in this challenge, then you decide who you think has the best pasta creation for the People’s Choice award winners. Share your experiences: Tweet (and don’t forget to tweet or instagram your photos) throughout the challenge, our twitter and instagram address is @vanfoodster and the hashtag is #PastaChallengeYVR please include this hashtag in all your tweets during the challenge. Get some friends together and make a night of it, visit 2 restaurants or more to share and taste the different pasta creations or go solo or with a friend – just remember to VOTE for your favourites between October 4-28, 2018. Here are the Pasta creations in this challenge, listed in no particular order other than when they were received by us. Description: It’s one of Chef Filly’s family recipes. Her father, Nonno Nicola was a farmer in Puglia and this was his favourite meal. 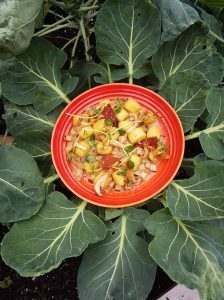 He would wake up before sunrise and make this hearty ragù sauce with cuts of beef short rib, fennel sausage and chicken and let it simmer slowly while he went to work in the fields. ‘Rosche’ is the Pugliese dialect for red. 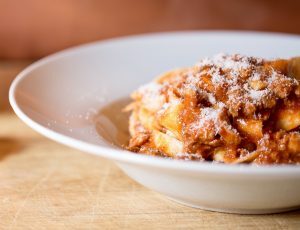 The thick pappardelle noodles are tinged red by the concentrated tomato sauce and the tender braised meat. It’s a perfect comfort food for these autumn evenings. Ingredients: Homemade fresh pappardelle pasta, Italian San Marzano tomato pelati, extra virgin olive oil, beef short ribs, fennel sausage, free range chicken, and parmigiano reggiano. We start with those basic building blocks and build the orange flavour in three ways: zest, orange juice, and agrumato blood orange oil. Agrumato is a technique of simultaneously crushing ingredients (in this case blood oranges). with olives to produce exceptionally flavoured oils. We add crushed pink peppercorn and fennel pollen to finish off the dish. 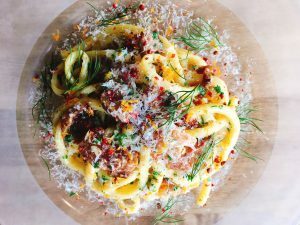 Ingredients: Bucatini, Guanciale, orange zest, orange juice, agrumato blood orange oil, shallots, white wine, pink peppercorns, fennel Pollen, Pecorino Romano. 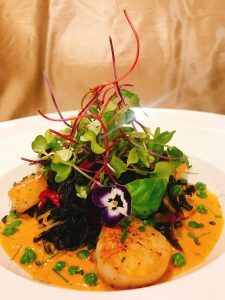 Description: Jungle-style, stir-fried, homemade Charcoal Spaghetti with Leeks, Portobello Mushroom, Young Coconut Meat, Lesser Ginger, Peppercorn, Green Peas, Lime Leaves and Basil served with pan-seared Scallops and Curried Crab Sauce. 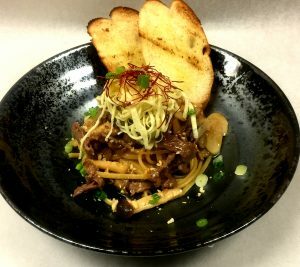 Ingredients: Matsutake, Portabella, Shimiji, soy garlic beef, light soy, sake, shredded egg yolk sheet, chilli, Nori dusted filone bread.